My sweet gelding, Out of the Blue. I have used both products, the Life Data Hoof Clay and Farrier’s Finish. I absolutely loved the Hoof Clay when I had a 1/4 crack in one of his hind hooves. It definitely helped with the healing process. Farrier’s Finish I use constantly. It’s a fantastic product that keeps his hooves in top condition. He’s barefoot and competes at the Beginner Novice level. Thanks to great hoof products by Life Data. For the past year my farrier has been working diligently to help my 13 year old AQHA gelding that had a bad case of laminitis. 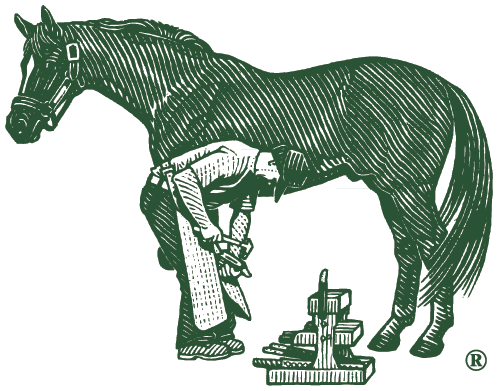 Between using the life data hoof clay and the life data farrier hoof supplement, progress is being made toward a new growing hoof. I believe these products have contributed greatly in the successful regrowth and protection of my guy's hoof. I can’t say enough good things about Life Data Hoof Clay! My horse was having some serious issues with hoof wall separation and cracking. I used the clay every other day after cleaning his hooves, and it made his hooves so much stronger! I filled any void in his hooves with the clay. I seriously have used too many products over the years. This totally surpassed all of my expectations and I will continue to use it! Best of all, it’s safe to use with bare hands and doesn’t stain or stink! It’s GREAT! Here’s my boy, Kajun! I'll ride off into the sunset knowing my horses' feet are getting the best care from Farrier's Formula and I'm comfortable in my FF t-shirt. Whether it is using Farrier's Finish to protect the hooves, or using the Hoof Clay to seal nail holes and protect the hooves from the elements, Life Data Labs has my horses' best interest in mind. Great products (I started with the Farrier's Formula Double Concentrate supplement and have never looked back) and great company! !